Zumbaholics know where the Party's At... so what are you waiting for!? Join the Party Jersey Style! Since its inception in 2001, the Zumba program has grown to become the world's largest – and most successful – dance-fitness program with more than 14 million people of all shapes, sizes and ages taking weekly Zumba classes in over 140,000 locations across more than 150 countries. Our Founder, Certified Zumba Fitness Instructor, Leslea Clark Piscatowski blends her passions for dance and fitness into everyone of her classes. She is a dedicated dance instructor, performer and fitness professional. Leslea began to dance at the age of 3 and took her desire for performing and training to the next level in college where she obtained a degree in Dance Arts. She then began to teach a variety of styles of dance for all ages and went on to pursue her love of movement through a fitness career. She has been sharing her love for dance and fitness with others for over 15 years. Leslea teaches at her family-owned dance studio in New Jersey and travels to teach private lessons or group choreography. Her dance repertoire includes Ballet, Tap, Jazz, Hip Hop, Pointe, Lyrical and Creative Movement. As an AFAA Certified Fitness Instructor, Leslea enjoys teaching Yoga, Pilates, Spinning, Sculpting, and of course Zumba classes at local gyms. You could find some of the best classes right here in New Jersey. Please feel free to browse our site and check out Leslea and her fellow ZIN(Zumba Instructor Network) friends. 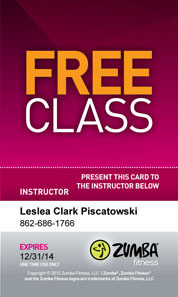 You will be sure to find a class that changes the way you see dance and fitness for life! We warn you, Zumba is very addicting... but who can't use some healthy habits in their life. Good Luck to you on your journey and we hope to see you shakin' it with us soon!